I made this 16th birthday card for my sister who was turning 16 at the time. She is really witty so coming up with something she would appreciate was a little difficult. Hopefully she will like it! 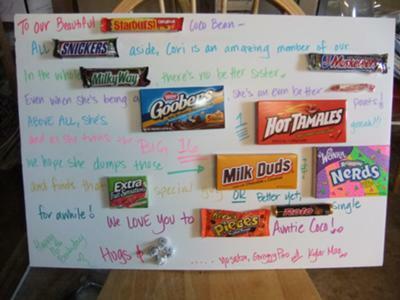 All SNICKERS aside, Cori is an amazing member of our 3 MUSKETEERS. In the whole MILKY WAY, there's no better sister. Even when she's being a GOOBER, she's an even better SMARTIE pants! Above all, she's 1 HOT TAMALE and as she turns 16, we hope she dumps those MILK DUDS & NERDS and finds that EXTRA (gum) special guy or better yet, ROLO single for awhile. We love you to PIECES (reeses pieces) Auntie Coco! Thanks for adding your clever birthday card for your sister. You did a great job! I'd especially like to say thanks for the idea of using the foam board instead of the usual poster board. I just had one of those "why didn't I think of that?" moments. :~) It's definitely a better idea, although I do realize that will cost a bit more. When you are using full-sized candy bars, as I usually do, the weight of the candy on the poster board is really unmanageable. I'm about to show my age. When I started making these candy bar cards, I don't think you could even buy the foam board! :) Thank goodness for progress! Your sister shouldn't have any trouble removing the candy. Hot glue guns are a great option because once the glue dries it is pretty easy to remove the candy. Thanks again for showing off your terrific 16th Birthday candy bar card! Love it!